Shotgun Stories is the story of three men, Son (Michael Shannon), Boy (Douglas Ligon) and Kid (Barlow Jacobs). They were named this way because their abusive alcoholic father couldn’t be bothered to come up with real names for them. When they were young their father walked out on them, leaving them with their hateful mother. Their father sobered up, became successful and started a new family, never speaking to the boys he left behind. Years later Son and his brothers find out that their father has died and attend his funeral. Son speaks his mind and spits on his coffin, leading to an escalating blood feud between the two sets of families. Shotgun Stories is writer director Jeff Nichols’ big screen debut, and the film is a beautiful and powerful look at two sets of families in rural America. The film contains only sparse dialogue between the characters, and that is all it needs. It never steps into overwrought exposition about what the father did or how the characters feel, as it doesn’t need to be said. Visual touches of the rural landscape and the respective homes of the two families show the lives of the characters so expressively that there is no need for additional dialogue. For example Son’s back is littered with shotgun shells and it is never definitively said how it happened, but the small allusions to it are more than enough to clue in the viewer. The film plays out as a revenge tragedy but overdramatic touches are kept to a bare minimum. Instead the film plays on a slow yet steady burn that carries an air of menace throughout. This is helped by the brilliant soundtrack and lingering shots of the small town they inhabit. The film also boasts excellent performances by the leads. Special mention must go to Michael Shannon as Son Hayes, the eldest of the three boys. Son doesn’t say much about his abusive lifestyle, save from his diatribe at his father’s funeral. Details are never gone into about the boys past but it is all shown on Shannon’s face. His stare is commanding and manages to convey the pain and simmering rage that he contains within him. The brief scenes of the three brothers hanging out together are well acted, and once again show how close the boys are without ever stating the obvious point. The disc itself has decent audio and video, nothing too flashy, yet nothing that diminishes the experience of the film. Special feature wise the disc contains only a theatrical trailer. A commentary track by the director would have been nice, but unfortunately this release is about as bare bones as you can get. Nichols has established himself as someone to watch out for in Hollywood for the coming years. The film is constantly riveting and never beats you over the head with its plot points. Well written, directed and anchored with some top notch performances, Shotgun Stories is a tense and tragic film that will keep you glued to your seat for its ninety minute running time. 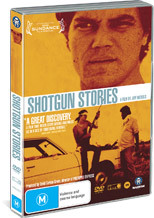 Despite its lack of additional features, Shotgun Stories comes highly recommended for any fan of film.